The Red Line is arguably Boston's most extensive subway line, extending from the outskirts of Cambridge, near Belmont, Somerville and Arlington, all the way to Dorchester and to Braintree. Alternating between above-ground and subway operation, the Red Line also provides the best views of the Boston skyline of any other subway line! 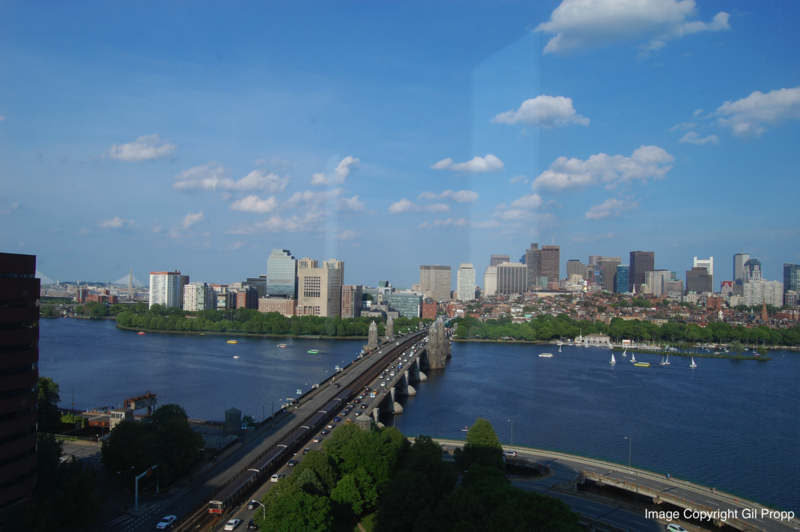 When the Red Line crosses the Longfellow Bridge, one is presented with a Boston panorama, extending from Kenmore Square to Bunker Hill and beyond. Red Line train running over the Longfellow Bridge. The view is truly panoramic! Similar views can be observed when riding the Red Line through Dorchester. When looking out over Savin Hill, one can see the colorful triple-decker apartment buildings that were built around trolley lines when Dorchester was originally constructed as a streetcar suburb (more on that in "Streetcar Suburbs" in the Articles section). Over the apartments pokes the Boston Skyline, and on the other side of the tracks the Boston Harbor Islands are clearly visible. Originally, the Red Line ran from Park Street Station to Harvard Square. The train started out at Park Street underground, emerged by the Charles River onto a short elevated railway and continued across the Longfellow Bridge before descending once more, this time into the Cambridge Tunnel that would carry the Line to Harvard. Today, the short elevated section of the Red Line, as well as the Charles/MGH stop on it, is one of the last elevated subway branches and stops in Boston. With Fields Corner and Wollaston stations south of Boston, the Red Line has the most remaining elevated stops of any line! Boston once had many elevated railways (See the "Orange Line article). In addition to the Charlestown and Washington Street elevated railways, the Orange Line once had a third elevated route, the Atlantic Avenue Elevated, that ran along Atlantic Avenue and provided a direct connection between North and South Stations! 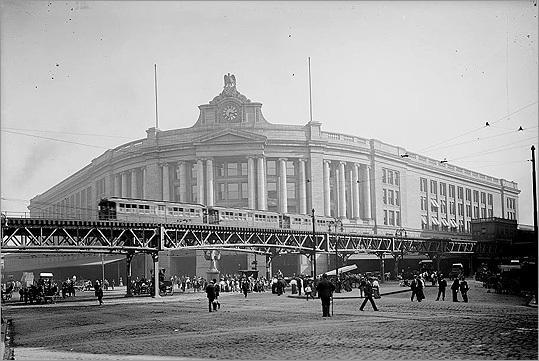 The Atlantic Avenue Elevated connected with the Red Line at South Station and with the old Green Line Elevated at North Station and was torn down in 1940s for scrap metal during the war and ultimately "replaced" by the elevated I-93 Central Artery and later by the Big Dig. Atlantic Avenue Elevated by South Station. The direct connection between North and South Stations is provided by the Route 4 bus today. By 1920, the Red Line had been extended to Andrew Square in Dorchester. Next came the mid-1920s Dorchester Extension to Ashmont/Peabody Square on railroad right-of-way acquired from the New York, New Haven and Hartford Railroad. Beyond Ashmont, the railroad right-of-way was used for the Mattapan High-Speed Line (see article under same title in "About the T"), a trolley extension of the Red Line to Milton and Mattapan. Slideshow of (PCC!) Trolleys at Mattapan Yard. Check out the "Mattapan High-Speed Line" article to learn more about this unique trolley line! Further extensions of the Red Line were yet to come. 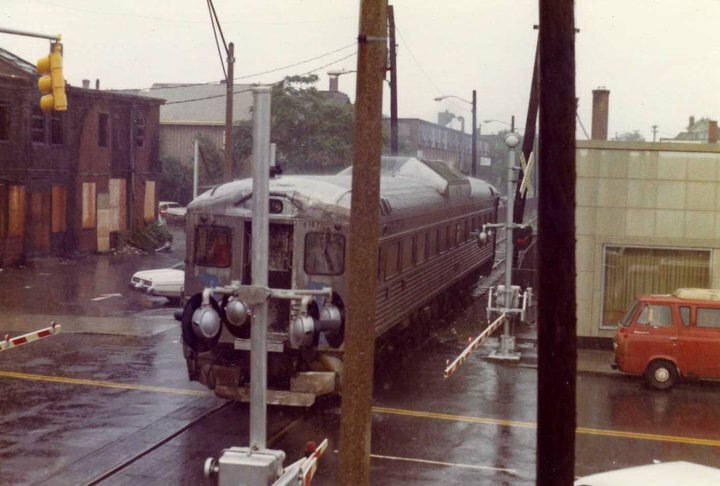 Between 1970 and 1980, the South Shore Extension was constructed, bringing the Red Line to Quincy and ultimately further to Braintree. It was thought to extend the Red Line further from Braintree all the way to Brockton, but that extension was never constructed. In 1985, the Northwest Extension of the Red Line extended the line's Northern terminus in Cambridge from Harvard Square to Alewife Station, replacing Boston and Maine Railroad service that once ran to Somerville Junction. The right-of-way from this rail branch was recycled into today's Somerville Community Bike Path; from Davis to Alewife, the Red Line runs directly under the path. B&M train crossing Davis Square pre-Red Line Extension. Image courtesy John Roderick. It was thought to extend the Red Line even further from Alewife to Lexington and Bedford along the old Boston and Maine Railroad branch. That plan never came through, though bus routes, particularly the 62 and 76, were established from Alewife to Lexington and Bedford to provide residents of those municipalities direct access to the new Red Line. The old Boston and Maine right-of-way was subsequently redeveloped into today's Minuteman Bikeway "rail trail," allowing residents of Arlington, Lexington and Bedford to bike to Alewife and take the Red Line to Boston. High-capacity bike locks are available at Alewife for anyone who wishes to do so. Biking this trail is definitely on my to-do list, and I will be sure to post photos of railroad remnants along the trail when I bike it! Update: I biked the trail! Sure enough, there were many remnants—check them out! The Northwest Extension of the Red Line required some rerouting of the Red Line around Harvard Square. Harvard Station's platforms were extensively reconfigured, and the station was closed for close to five years for renovations to take place. In the meantime, two temporary stations were constructed to provide riders with access to Harvard Square. The first of these stations was Harvard-Holyoke. Harvard-Holyoke was located on Mass Ave very close to the present-day Harvard Station's main entrance in the center of the square. The station closed in 1983, but much of it is still intact. On a train between Central and Harvard Stations, one can look out of the window and see the remaining Harvard-Holyoke platforms. On Holyoke Street by Mass Ave, there is a grating in the sidewalk. Looking down into the grating reveals a hollow trench! This was once the location of the head house and staircase for Harvard-Holyoke. Next time I pass through Harvard Square, I'll try to get photos I can post here to show you this impressive remnant. The second temporary station in Harvard Square was Harvard-Brattle. This station was located in the old Eliot Yard Red Line maintenance facility, once located in Harvard Square but since redeveloped into Harvard University facilities. Harvard's Kennedy School of Government sits roughly where the yard once was. Just as the yard was completely demolished, so too nothing remains on street level of Harvard-Brattle, though an old tunnel that once ran to Eliot Yard still exists under the streets of Harvard Square and is used today for MBTA storage. The Red Line's rolling stock is the most diverse of any of the T's lines. While the newest Red Line cars (1800 series), built by Bombardier, were built in the mid-1990s and feature electronic stop announcements and digital roll signs, the oldest Red Line cars (1500 and 1600 series) are Pullman Standard subway cars built in 1969! The 1700 series cars, built in the late 1980s by UTDC, look identical to the Pullmans and accordingly are mechanically compatible with them. Riding the Pullmans is always an interesting experience. For one thing, they are the only Red Line cars to feature forward-facing seats like those of the 3600-3700 cars on the Green Line. Originally, the all of the Pullmans' seats were laid out forward-facing, but they were later converted to aisle-facing seats like the rest of the Red Line cars. Even so, today some forward-facing seats at the front and rear of the 1500 and 1600 cars remain. Also, look closely at the subway map pane on a 1500 or 1600 car—a new Red Line map has been affixed over an older one that evidently originally read "Ashmont-Harvard" but later was edited to reflect the newer extensions. After all of those edits, the T must have seen it fit to simply stick a new, up-to-date map on top of the old one, which must have looked slightly messy by the end!